The jury’s still out on how much I liked this one. It has some beautiful moments. It also has some awkward moments. The story is entertaining, but I’m really not compelled to find out when the next book of the series comes out. The characters are all likeable, but I didn’t fall in love with any of them. I found the title on a list of noteworthy books of 2011, but I’m not sure I’d laud it among the best. I guess I’d have to say it’s a middle of the road middle grade read. I’m still confused at the end of the book. I have absolutely no idea what’s going on in this “worldwide conflict” that Cara’s mother is a part of. Indeed, I’ve hardly seen evidence of it. Who, exactly, is the Cold One? The book feels more like a scavenger hunt than a rescue mission, and at the end the kids have accomplished virtually nothing. I know there are more books coming in the series that will further the adventure, but right now I’m so in the dark that I don’t much care if I press on. A little more information, a little peek at what’s really going on globally, a little hint into the evil opposition would have been much more intriguing. This book contains a LOT of global warming, the polar bears are dying, save the world science that I get so tired of. And it pretty much bashes all us idiots who don’t agree. There’s also a fair splashing of mild profanities. On a positive note, I really enjoyed the beauty of the scenery: the sand cliffs at the edge of the ocean, the smell of salt, the seafood restaurants, the crowded tourist towns just beginning to slow for fall, the new chill in the air. It’s appealing. I also loved the scene that takes place beneath the sea at two in the morning during the phosphorescent glow of a red tide. Very cool and original! Sweet adventure rating – The adventure could have been a bit meatier, though I suspect it will pick up in later books. It has to. The sweetness lies in the setting and within Cara’s strong, stick-together family. 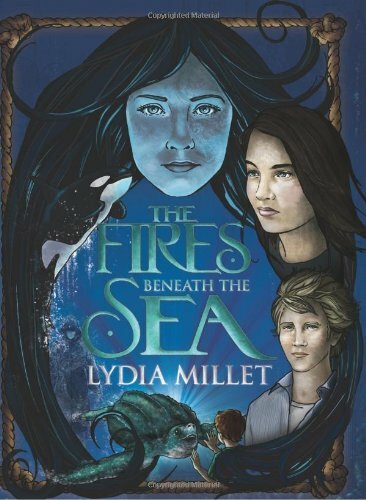 I haven’t any sweet treat recommendations for you; however, if you like seafood as much as I do, you’ll probably have to take a trip to Red Lobster after reading The Fires Beneath the Sea. This was one I was really divided on. It had some great things, and some not so great. Yeah, this is one I wouldn’t strongly push. I reviewed it mostly to balance the high recommendation on that library list. The way you spoke about this one it reminds me of Neversink which had some of the same story idea to it and left me on the fence as well. Thanks for stopping by, Jessica. Neversink is a new one to me. The cover looks nice though! 🙂 Thanks for sharing! Thanks for your honest review. Don’t like being confused at the end. Perhaps the series will flesh out more of the story.